Wash and scrub the potatoes and prick them several times with a fork. Bake for 45 minutes. In a large saucepan bring 6 cups of water to a boil. Drop the florets in and cook until they turn bright green, about 2 minutes. Strain the broccoli and shock it in a bowl of ice water to keep it from continuing to cook. Drain and set aside. Saute the onion with the butter until soft, about 5 minutes. Add the flour, and stir for 1 minute. Add the milk, dijon and worcester sauce. When the milk is steaming but not quite simmering, add the cheddar and parmesan by handfuls into the milk. Make sure to incorporate all the cheese before adding more. 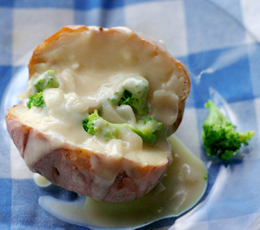 Slice the baked potatoes lengthwise, and top with broccoli florets. Ladle the cheese sauce over the potato and prepare to feel like a happy child.